Holy Week in the Philippines is commemorated with people praying and reflecting. And since it falls on the hottest days of summer, most families spend a day to cool down at the beach. This is what we did last Wednesday. The kids enjoyed the splashing in the water and building sand-castles while the oldies simply sat back and enjoyed the change of view. In order for me to improve my Google page rank, attract more visitors and not to mention generate income from my blog, I am thinking of a total blog make-over. Since I consider myself a greenhorn in the blogging scene and a newbie to web-hosting, I sought the advise of people who has been doing this for a long time. One advise that I got from them is to choose a good web host. My search led me to Kaushalsheth.com. Kaushalsheth.com offers various Wordpress templates that he himself designed. As a template designer, it is important in his work to have a reliable host. Otherwise, it affects his work schedule and causes him stress. The site offers information on what’s the best web hosting sites available on the net as a result of his tedious search for the perfect hosting site. Kaushalsheth.com recommends three hosting sites that are cheap but reliable and has good technical support. Go visit Kaushalsheth.com and know more about the three recommended sites in his site before you make a decision. My father turned 62 last March 16. Wow – 62. I can’t imagine my father is this old. 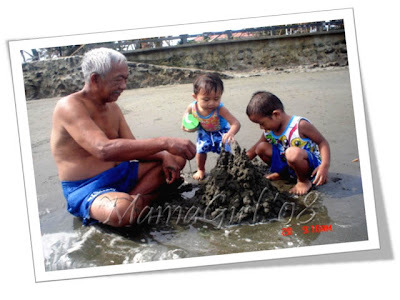 It only seems like yesterday, he was a macho guapito, like his idol Rico Puno.. and now, he's a grandpa to 3 kids. So with Mama and Beebop, they went to church. Right after they came home, my father was all smiles because Bigboy called to greet him. Calls like this, especially on his special day, never fail to warm my father’s heart. My father told us beforehand that they are not expecting any visitors, those who remember are welcome and those who forget, well , it’s their loss. Both Mama and Papa were busy in the kitchen, preparing a number of dishes. There’s kare-kare, siomai, the ever-present pancit and spaghetti for long life, and kilawing pating. My mother was in charge of the dessert – which she so lovingly prepares everytime - maja blanca and gulaman this time. Visitors arrived only after lunch. And one by one, the house is filled – mostly cousins and their families. Drinking session started and the first one to be knocked down was the celebrant himself. Hahaha. But not before he started his list of accomplishments for the year. Oh well, when alcohol starts to get into one’s system, one cannot control what he/she can do. My seester called him up, too, and he couldn’t be happier. Here's my entry for the Tuesday and Wednesday edition of Wordless Wednesday. To participate, click here. Everyone I know have credit cards. Who doesn't, nowadays? A lot of people now prefer transacting with their plastics rather than cash that the number of people who carry cash are getting fewer and fewer as more and more restaurants, groceries, shopping malls, and almost all business establishments - virtually everywhere – accepts credit cards. However, good things almost always turn to bad -- it is when credit card users use their cards irresponsibly, and then fall into a monster debt trap. Most people I know use their credit cards way beyond their limits and end up with a bad credit card history, making it impossible for them to get back on the credit card track. Fortunately, there are credit card companies who are willing to help you get back on your feet. If you want to know where they are - Badcreditoffers.com is the answer. It is intended for credit card users with poor credit history and/or ratings and looking to rebuild credit history anew. Badcreditoffers.com has an up-to-date compilation of top credit offers, not only on credit cards, but also home loans, auto loans and personal loans. I think the best feature of all is the list of the top 10 credit cards for the bad credit where you can compare the offers and make an informed decision. Once a customer has chosen the credit card that offers the best features suited for them, they are automatically linked to its respective online applications. Just a friendly advice: spend on items that are within your purchase capacity. Otherwise, you won’t be able to pay back and get a bad credit history again. Always remember to use your credit card wisely. Don’t let it use you. Indeed, it is. Please allow me to describe what I'm doing in the picture as someone commented about not getting it. In the picture, I am demonstrating how to draw water under the ground using a pedal pump, and it took me about 10mins to fill a bucket. 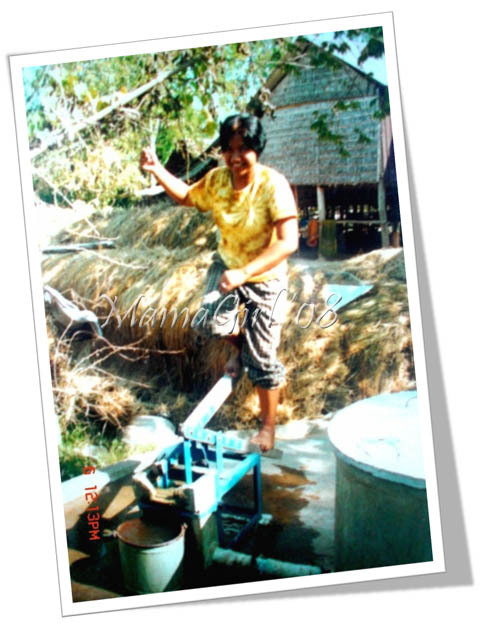 Pedal pumps like this are effective in responding to water shortage and lack of irrigation systems in rural areas of developing countries like Cambodia and India. I used to work with HEKS Cambodia Program from 1999-2003, helping rural people improve their livelihood by introducing sustainable agriculture activities and organize community-based organizations to enable them to help themselves. As mentioned, it takes a lot of stamina to fill a bucket - it's equivalent to doing one session of aerobics. 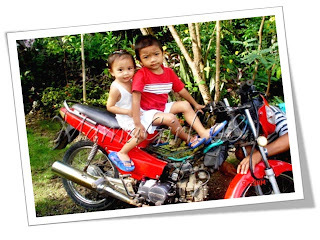 To know more about HEKS Cambodia Programme, click here. Many of the most popular bloggerss of today started from using free blog hosting sites like Blogger, Wordpress, and many others. As time goes on, when they have gained a lot of popularity, they move on to have their blogs registered in their own domain names where they have the flexibility to customize their blog lay-outs. As for me, and for countless others, it is also my fervent wish that I would be able to register my blog in my own domain name sometime in the near future. Many bloggers who registered blogs in their own domain names say that running a blog in with their own domains allows them the luxury of customizing the look and design of their blogs using plug-ins that are far better than those offered by free blog hosts. And they make these things look so easy, of course, but to us who are technically-challenged, it is actually not. Much as I want to register domain in the near future, I searched some options this early and found something. Paylessdomains.com.au is one of the most popular sites, especially in Australia, specializing in domain registrations. It provides cheap domain names and website hosting and yet competitive in terms of features and services. Services don’t stop at domain registration alone. Paylessdomains.com.au gives a whole bunch of other services as such as 24/7 customer support, free email hosting, free URL forwarding, free domain name parking, and many others to help customers manage domains. No wonder they are the most popular domain registration site in Australia. Any gambler in the world would know that slot machines are the most popular games in casinos. And you know why? It is because it is the simplest and easiest of all games to be played on – it requires very little skill and is very addicting. Nowadays, with the onset of online casinos, this popular game of slot machine was brought online as well. More and more people are saying that they find it even more enjoyable to play slots online than inside real casinos. Don’t know which online slot machine site to go to? No worries. Onlineslotscity.com comes in – they provide slot machine players with the best and the latest online slots reviews and which are the online slots with best bonuses. Onlineslotscity.com provides brief but comprehensive reviews and ratings that are of best use to players, and, guarantees higher chances of winning. So what are you waiting for? If your hands are itching to try slots online, go their site and see for yourself. Playing online slots allows you to play and enjoy the game, just by clicking the mouse, and right at the comforts of your own home. I am tagging Mheldz and Venu. For other WW photos, click here. Online casinos are everywhere over the Internet and it is undeniable that the numbers of both online casinos and players are steadily increasing. I once said that I'm curious and would like to try it. But how could I chose which online casino sites are credible, safe and secure? In other words, which online site is best suited for a beginner like me. And the most important question of all is - how do increase my chances of winning? I know most of you will say to me - have you heard about websites reviewing online casinos? Of course there are lots of online casino reviews available now and so selecting the best one is quiet hard to do. I know it is important to select which online casino to go to since it involves money. Prior to choosing, it is best and quite important to know what other people's ideas or experiences are with a particular online casino website. Online-casino-list.com offers a list of best US online casinos voted by players themselves. Anyways, Online-casino-list.com generally provide informative reviews of the top 60 best online casinos for those who want to know. Just a reminder, gambling is not legal in all countries so you might want to check out your local laws and regulations before doing anything. These scenes greeted me when I returned to Roxas City after a three-day Strategic Planning seminar in Iloilo City. We were all speechless when we saw how mother nature created havoc in this sleepy farming town. On the national highway, buses, cars and other vehicles were unable to pass through because of the high water level. The crops were all ready for harvesting if not for the heavy rainfall. My heart went out to the poor farmers whose crops were totally wiped out by the water. The farmers did not lose only crops, but also lost their properties (cattle and farming equipments) and destroyed their houses. In fact, many have been feared missing or, worse, dead. Also, many farmers fear how they would survive this year now that the crops that they had hope to bring them income is gone? Local authorities are collecting information as to how many families were affected in the municipalities of Sigma, Dao, Cuartero and Mambusao - all of which the provincial government have declared as areas in state of calamity. Up to this point, the government has not determined how much was the damage in these municipalities in terms of crops and properties. Most of the population were evacuated in evacuation centers and are receiving relief support from the government. Our organization is also readying for a rehab project. To those who want to donate some clothes, canned food and others, please direct them to the Office of the Provincial Governor of Capiz, or through Katibyugan, Inc., the non-profit organization where I am working. Leave me a message here or send me email. Any form of help is very much welcome and appreciated. I am not surprised anymore (and I am angry) that news like this about Capiz did not or do not merit any attentional from the national media. To media companies, Gretchen's bitchiness is far more important than thousands of farmers devastated by floods and therefore gains a place in the headlines. The only time that Capiz is given attention to by the media is when the subject points at Capiz being the haven of aswangs (flesh-eaters and other supernatural beings). That, we Capizenos are not too happy about, and I am only being polite when I say that. How this affects every Capizeno is worth another post.